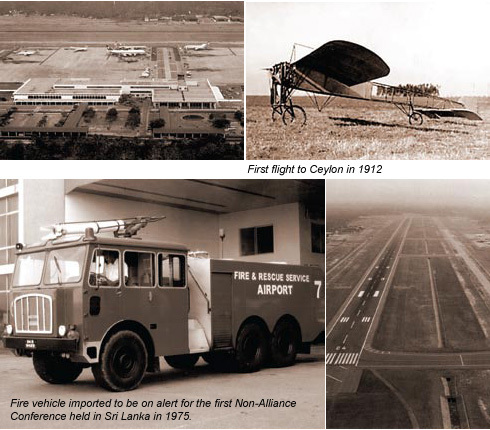 Sri Lanka's civil aviation industry was born in the 1930's with the construction of an aerodrome in Ratmalana and it served a largely administrative function. The slow growth experienced by the industry in the early years is a reflection of the historical and social conditions the country faced at that time. Since then, the industry has come a long way to be what is today. The outbreak of World war 2 in the 1940's saw the development and expansion of runway facilities as a consequence of Sri Lanka (then Ceylon) being under British rule. Once hostilities ceased and with independence dawning on the horizon, airline operations become a symbol of nationhood and there was the growing realization that the development of the aviation industry could be a catalyst for national development. In 1947, the country's first national carrier - Air Ceylon - inaugurated international flights from Colombo to Madras via Jaffna and since then the number of international flights out of Sri Lanka has grown considerably. During the 1960's and 70's the royal Air Force and Ceylon offered domestic flights from the Ratmalana Airport to destinations such as Jaffna, China Bay in Trincomalee, Batticaloa, Ampara and Weerawila to name a few. These destinations with their fascinating tourist attractions, proved to be popular among government employees. Domestic air travel was subsequently taken over by the Sri Lanka Air Force and Upali Aviation while Air Taxis of the Maharajah Organization operated charter flights to most of the local airports in the country. Passengers requesting flights ranged from local and overseas tourist to businessmen. Aviation was not restricted to domestic flights and international travel on Air Lanka, which was inaugurated in 1979, also began to increase in popularity. International flights ware eventually shifted to the new airport at Katunayake. With the onset of civil riots in July 1983 however, domestic aviation operations came to a sudden half and although attempts were made to resume local flights, it did not meet with much success until several years later. Following the signing of the Ceasefire Agreement with LTTE rebels in 2002, which heralded a period of temporary peace, several local airlines commenced domestic operations to destinations such as Jaffna, Trincomalee and Ampara. Sri Lankan Airlines (former Air Lanka) also began domestic operations using amphibian aircraft to and from the Bandaranaike International Airport in Katunayake to a number of tourist destinations around the country. Gregory Lake in Nuwara Eliya, Victoria and Randenigala reservoirs, koggala and Weerawila were among those that become increasingly popular destinations for both local and overseas passengers. These flights were unique, because they were not restricted to precise straight-line air routes but were allowed to circle around the areas of interest enabling the passengers to enjoy the landscape and its scenic beauty. This proved to be a success, winning over people who had never previously considered exploring the country beyond the familiar suburbs. However, these operations were suspended once again with the recommencement of hostilities in the North and East of the country. A significant event in Sri Lanka's aviation history was the partial privatization of Sri Lankan Airlines (then Air Lanka) in 1998 under a ten year management contract with the Emirates Group, ending in 2008. This significantly changed the course of the airline's development and fashioned it into what it is today. 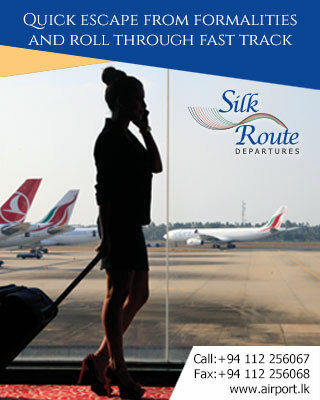 Sri Lankan Airlines is a highly recognized global carrier, serving 45 destinations in 25 countries across Europe, the Middle East, South Asia, South East Asia and the Far East. It is also one of the largest foreign carriers operating to India, with 90 weekly flights to 11 destinations and the largest carrier to Maldives with direct flights from Europe. The advent of peace in the country now offers numerous opportunities for the development of Sri Lanka's domestic and international aviation sectors in the years ahead. AASL presently shoulders the challenge of developing and managing four airports namely Bandaranaike International Airport (BIA), Colombo Airport (RMA), Mattala Rajapaksa International Airport (MRIA) and Batticaloa Airport that fall within its purview in executing the statutory responsibilities. Governor of Ceylon negotiates to extend the airmail service between the United Kingdom and India via Ceylon. State Council of Ceylon makes a decision to construct an aerodrome at Ratmalana. Aerodrome at Ratmalana is completed and Aero Club of Ceylon provides the public with flight opportunities. First Air Navigation Regulation are published. The first three aircraft bearing the Ceylon registration mark are entered into the aircraft register. The Ratmalana Airport is inaugurated on the 28th of February. The Director of Public Works is appointed Director of Civil Aviation. An emergency landing is conducted in Puttalam. With the outbreak of World War 2, the Royal Air Force takes control of functions at the Ratmalana Airport. The United Kingdom - Australia "LANCASTRIAN" service commences operations via Ceylon. The development of Civil Aviation is established under the Ministry of Transport. The Ratmalana aerodrome is taken over from the Royal Air Force for civil flying. Air Ceylon - the National Carrier is set up under the Ministry of Communication and Works and inaugurates international flights from Colombo to Madras via Jaffna. Sri Lanka is appointed member of the international Civil Aviation Organization (ICAO). The Navigation Act No. 15 of 1950 is promulgated. An Academy to train pilots is established. Air Ceylon enters into an agreement with KLM Royal Dutch Airlines. International flights shift operations to Katunayake. Development program of Katunayake Airport Commences. The RAF Runway is extended from 1,840 to 3,350 meters with assistance from the Government of Canada. Terminal Building is constructed to hold 150,000 passengers per year. Construction takes places of a larger terminal building, apron and taxiway. Inauguration of the National Carrier Air Lanka. Airports Authority Act of 1979 promulgated and the Airport Authority is established. he Airports Authority takes over civil airport operations from the Department of Civil Aviation. The Airports Authority takes over civil airport operations from the Department of Civil Aviation. Amendments are made to the Air Navigation Act. Development program launched to construct a new runway, Passenger Terminal Building, Cargo Complex, Control Tower and Navigation Services and Maintenance Complex. Development program is completed and the runway and passenger terminal building commissioned with an annual handling capacity of 3.5 Mn Passengers. The Air Cargo Village inaugurated. A completely new outlook is commissioned for the Airport in November with the construction of a finger pier with eight Aero Bridges, Expanded terminal, lounges and other facilities. AASL celebrated 25 years service to aviation. Sri Lanka's second International Airport MRIA at Hambanthota declared open on 18th March.